Betty Eisenbeisz, 93, Mandan, died January 27, 2019 at St. Vincent’s Care Center, Bismarck. A funeral service will be held at 10:30 am on Thursday, January 31, 2019 at Buehler-Larson Funeral Home, Mandan. Burial will be at Mandan Union Cemetery. Visitation will be held one hour prior to the service at the funeral home on Thursday. Betty was born April 23, 1925 in Mandan to John and Emma (Bauman) Yunck. Raised and educated in Mandan, she lived on a farm south of Mandan. Betty later moved into Mandan with her parents and grandparents. On October 15, 1947 she married Robert Eisenbeisz. Betty worked the lunch counter at Lucas’ clothing store in Bismarck. She enjoyed walking everywhere she went whether it was to the bank or her regular trips to Hardee’s for coffee. 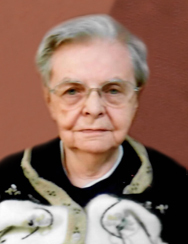 Betty was a member of First Lutheran Church in Mandan. Survivors include her step-daughter, Marcella Eisenbeisz of Salem, OR and her friends and care givers, Jeannette and Roy Friesz, Mandan. Betty was preceded in death by her husband Robert in 1982 and her parents.